This is a guest post written by Davis Lin. Want to contribute? Check out the 2018 publishing calendar. We all know that most consumers prefer to buy from people who they know, like and trust. As a coach and owner of your business, the onus lies with you to ensure that your ideal clients get the opportunity to know, like and trust you, so they can become your client. The most common way that coaches try to build that rapport is through a free coaching session, and from there, get that person to sign on as a client. But the question is, how do you get them on the call in the first place to demonstrate that you can actually help them? The answer to that is to build a relationship even before they come onto the free coaching call, so that, by the time they speak with you, they would already know the value you can provide and will be more inclined to take up your coaching offer. The way to do that is through a well-crafted email sequence. When done properly, a good email sequence can get your ideal clients excited and enthusiastic about the results you can get for them, even before they get to speak with you. When you have a good email sequence, it will let your ideal clients see you as the authority in your market, make them feel you really understand them and let them think that you are the only logical choice to seek help from. When this happens, you will find that it becomes much easier to convert them into actual paying clients without you having to try hard to convince them of your value. This is because your email sequence would have already done most of the heavy lifting to indoctrinate them. By the time they get on the call with you, they would already know the benefits they can get from working with you and the results you can get for them. Feeling the weight of how important a well-crafted email sequence is for your coaching business? Good, because this is how you can stand out from your competitors and let people see you as the go-to expert for help. Let's dive into each of these core objectives in detail. The main reason why people need coaches in the first place is because they have a problem they need to solve. However, not many people really see the importance of getting a coach and would rather try and do things on their own. This can be risky because if they aren’t doing the right things, it can end up causing them more harm than good. So, it's important to let them realise the need to get help for their situation in your email sequence, by demonstrating that you understand the problems, pains and struggles they are going through. This is also where you give them valuable information that can help them get one step closer to solving their problems and achieving the results they want. When you do this, it lets your ideal clients feel so much more connected with you because it shows that you clearly understand their situation and can really help them. A powerful to way to do this is through what I call the Zero-To-Hero (ZTH) Steps. First, you identify the exact problems your ideal clients are facing, and the main end result they want to achieve. Then, you break down the steps in-between that they have to take in order to achieve that end result. Now that you've gotten the steps down, the next part is to turn each of these steps into separate emails with a compelling and irresistible headline so that your ideal clients will want to click and read your emails. In these emails, you want to give away some of your best methods and techniques. When you do this, your potential clients will not only see you as someone who really understands their problem, but also let them feel that you really do care and want to help them. Overall, this will help increase your chances of getting them as paying clients. We all love to read the success stories of other people because it makes us feel that if other people who are in similar situations as us can achieve the results we want, then we certainly can achieve those results as well. For example, if you think of some of the recent expensive purchases you’ve made, chances are that you have probably read some positive reviews or testimonials that made you feel more certain about buying the product or service, right? That is why case studies, testimonials and success stories from your past clients are so powerful and effective to acquire new client. They not only help make potential clients who are on the fence feel inspired, but they also allow them to see what's possible for them if they were to take you up on your coaching services. So, that means that you want to showcase as many case studies, testimonials and success stories of your past clients as possible. The more detailed it is, the more compelling your emails will be. But, what if you are just starting out and do not have any clients yet? In this case you can simply show a case study of how you overcame some of the problems (that your ideal clients are also facing) and the results you have gotten. As long as you can walk them through the experience you went through, you will be amazed by how much you can inspire and motivate them through your case study. We all have some objections in our minds before buying anything. Objections are basically the concerns we have about the product or service. These are the objections that are preventing my wife from enrolling my son to the preschool. It’s only when these objections and concerns had been adequately addressed that my wife then made the decision to sign my son up for the preschool. In your coaching business, your ideal clients are sure to have some objections about your services as well. The best way to handle these objections is to first understand the concerns your ideal clients have and then reframe them in a way that will eliminate their worries. For example, one of my clients is a relationship coach that helps couples salvage and strengthen their relationship. One of the biggest objections that her ideal clients have is that their situation is unique and they aren’t sure if she can actually help them. Every time she sent some tips in her emails, she would have people replying that her tips wouldn’t work for them because their situation is unique. However, she was very sure that those tips would work for them if only they really understood how to use those tips in their situation. Option 1: Let her ideal clients understand that their situation isn’t unique because of the common factors in every relationship leading up to a break up. Option 2: Agree with her ideal clients that their situation is unique and then let them know that is the reason why it’s crucial to have a coach look into their specific situation to come up with a customized solution for them. She decided to go with the second option because whenever she tried to explain to her clients that their situation isn’t unique (basically disagreeing with their views), she would get lots of resistance. With that in mind, she crafted an email with the title “How To Salvage & Strengthen Your Relationship In Your Unique Situation” to specifically tackle this objection. In this email, she would start by first acknowledging that every relationship is unique and different. This is important to let her potential clients know that she understands their concerns. Then, she goes on to detail exactly how she had helped many different couples with different situations before. After that, she would educate them on the principles that govern a successful relationship and how some of her clients applied it to their situation successfully. At the end of the email, she included a call-to-action to invite her ideal clients on a free call with her to share their unique situation and offer to come up with a customised plan for them. With this email, she found that the number of objections she got in this aspect decreased significantly. Furthermore, it helped her book more free coaching sessions and subsequently get more new clients. So, the idea here is to create a separate email for each objection your ideal clients have and come up with a good reframe for it. Then have a call-to-action at the end of the email to invite your ideal clients for a free coaching session with you, where you can convert them into a paying client. One of the key factors that determines whether your emails will actually connect with your ideal clients is how much you really know about their pains, problems and objections. For example, if you write about a problem you think they have but they actually don’t (or it’s not a big enough problem), then your emails just aren’t going to build a deep connection with them because they will feel that you don’t understand them. And when they feel this way, they will unsubscribe from your list. That is why it’s very important to nail the right pains, problems and objections your ideal clients have to create a compelling email sequence. So, how do you actually find out about these key details of your ideal clients? For example, at the end of the very first email I send to my subscribers, I tell them to click “reply” and let me know what are the problems and challenges they are facing. It allows me to know what their actual problems and challenges are. It opens up the opportunity to have a conversation with them and then get them on a free coaching call with me. “Hey, I noticed that you had the opportunity to come on a free coaching session with me to help you, but for some reason you chose not to take it up. That’s absolutely fine, however I was wondering whether the reason you chose not to take it up was because of something I said or something I didn’t say? As you know, I want to help many people as I can, so if you could do me a favour, hit the ‘reply’ button and let me know the reason why you hadn’t taken up the free coaching call with me. With this email, you will uncover the different objections your ideal clients have and from there, come up with a reframe for each objection. 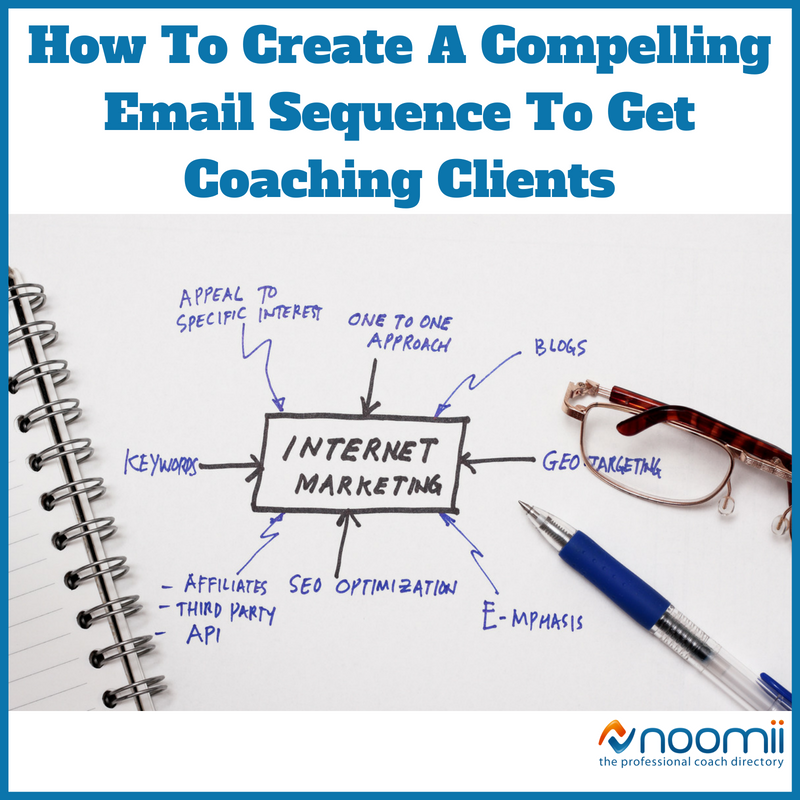 Ultimately, the goal of each email in your email sequence is to present your ideal clients with the opportunity to get on a free coaching call with you, so you can convert them into a paying client. That's why ending each of your emails with a call-to-action (CTA) is very important to ensure that they do schedule a call with you. In order to get more coaching clients and become the go-to authority in your target market, building a relationship with your ideal clients is crucial. And the best way to do that would be through your email sequence. Hence, it’s very important to spend the time to craft a compelling email sequence. When you are able to let them feel that you really understand them and show that you really can help them get the results they want to achieve, not only will it help you get more clients, but also allow you to impact more lives through your coaching. Davis Lin is a Client Acquisition Strategist and Founder of Client Acquisition Lab. He specialises in helping coaches & consultants upgrade and automate their client acquisition process, so they can get more highly targeted leads and premium paying clients, without having to manually chase leads one-on-one. To find out more, you can download his Client Acquisition Blueprint for FREE here.